Birthday Girl Laura Weightman not only won the UK Women’s 1500m title at Birmingham’s Alexander Stadium on Sunday, she also firmly booked her place on the plane to Berlin, and next month’s European Championships. The 27-year-old from Alnwick, who now represents Morpeth Harrier, has built up her preparations carefully, under the guidance of coach Steve Cram, following her return from April’s Commonwealth Games, where she competed over the longer distance of 5000m, winning an excellent bronze medal. On Sunday, however, Weightman showed that she still has what it takes to win at 1500m, taking the lead on the final lap from long term leader Jessica Judd of Chelmsford. Judd had previously won the heat on Saturday, where Weightman had qualified for the final by finishing third in a very modest 4m16.18s,. But in the final she ran superbly to win in a time of 4m08.80s, and although a little adrift of her lifetime best it was a pleasing victory nonetheless. 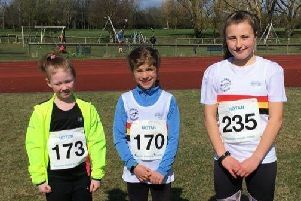 Another Morpeth Harrier in action at the Championships on Sunday was Mhairi MacLennan, who finished 14th out of 21 finishers in the Women’s 5000m, posting a finishing time of 16m48.27s, which was around forty seconds adrift of winner Steph Twell of Aldershot. * It’s been a busy week for athletics - for all the latest news on Alnwick Harriers and Alnwick Triathlon Club turn to page, and for an update on the Northumberland School Games see page 67.